Collins came to Lynchburg from rural Sutherlin, Virginia, just three years ago, armed with an associate degree she earned while in high school. While attending Lynchburg, she worked 20-to-30-hour weeks at J. Crew, along with a second on-campus job as an assistant in the psychology lab. She’s also worked as an archives assistant and Peer Assisted Supplemental Study (PASS) leader. 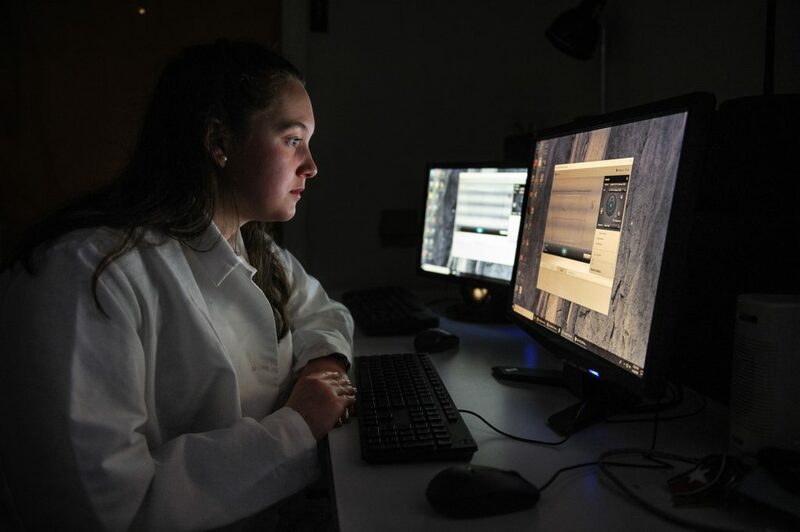 During her senior year, Collins was part of the “Research Dream Team,” a trio of psychology students who studied the effects of exercise on anxiety, using zebrafish as test subjects. Last year, she studied the effects of L-DOPA, a drug used to treat Parkinson’s and other diseases, on zebrafish. Her familiarity with the striped, guppy-like fish will be beneficial when she heads to Montreal this fall to pursue a doctorate in neuroscience at McGill University. There, she’ll study under Dr. Myriam Srour, a pediatric neurologist who uses zebrafish to research congenital mirror movement disorder. This summer, before she starts graduate school, she’s headed abroad again. She’s going to Tanzania to climb Mount Kilimanjaro. “It’s the number one thing on my bucket list,” she said.